All Fools’ Day may be past (shame), but this being BTN’s Cruising issue and editor-in-chief Malcolm Ginsberg at sea on Cunard’s Queen Victoria as we speak, we are happy to pass on one of the best of this year’s 1 April sillies. Followers of Royal Caribbean were intrigued to read in a seemingly-official press release sent on Thursday, 31 March, that the company was planning a new line of ‘space-cruise ships’. 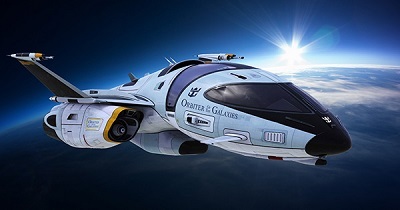 The first would be named Orbiter of the Galaxies and was scheduled to take off in 2030. There followed detailed descriptions of on-board facilities and a quote from Royal Caribbean’s UK/I managing director, Stuart Leven: "We are always looking for new ways to deliver the extraordinary and what could be more spectacular than cruising through space? Just imagine the holiday pictures." Quite. Perhaps only the stern injunction on the email “Strictly embargoed until 00:01 on 1 April” gave the game away, but it was fun while it lasted. Full marks – and Royal Caribbean even produced a picture (below).